YOUR INTENSIVE CARE HOTLINE - Can you go home on CPAP/BIPAP ventilation? My husband hasn’t been waking up for the last two weeks after open heart surgery and he remains in an induced coma in Intensive Care! Is this normal? So let’s look at this question in more detail. Mechanical ventilation in Intensive Care is on the rise especially with people living longer and people wanting to have choice. Therefore with more people requiring mechanical ventilation in Intensive Care and with more and more people getting educated about their health, as well as getting educated about their choices when requiring Intensive Care services, it’s a good question to ask. So they are the different forms of CPAP/BIPAP ventilation modes and I will clarify in a moment what it all means and how it impacts on the possibility to go home. CPAP stands for continuous positive airway pressure. It basically means that a certain level of positive airway pressure is constantly being delivered. BIPAP stands for Bilevel inspiratory positive airway pressure. BIPAP basically operates on two different positive airway pressures and it tends to make breathing easier compared to CPAP as it offers two different levels of positive airway pressure. One higher and one lower positive airway pressure. Both, CPAP and BIPAP are very similar ventilation modes. This mode of ventilation is often being in a home care setting for sleep apnoea. Many people are requiring CPAP or BIPAP at home overnight for sleep apnoea and they can self manage as they are otherwise healthy most of the time. Invasive ventilation is mechanical ventilation with a breathing tube or endotracheal tube or via tracheostomy and I talk more about that in a minute. CPAP/BIPAP ventilation with a face mask (NIV) is either used to prevent invasive mechanical ventilation with a breathing tube or endotracheal tube or with a tracheostomy and it’s also often being used after mechanical ventilation with a breathing tube(endotracheal tube) or tracheostomy when intermittent ventilation support is still needed on your critically ill loved one’s way to recovery. Therefore either scenarios are possible in an Intensive Care setting. In the ideal world, CPAP/BIPAP ventilation with a face mask(NIV) is being used temporarily and after the lungs have regained their normal or physiological functionality, your critically ill loved one will be able to leave Intensive Care and go to a hospital ward. In some instances however, permanent or intermittent CPAP/BIPAP ventilation with a mask is required and a weaning is impossible. The answer is yes, therefore let’s check out how this can become a reality. If you or your critically ill loved one is thinking about going home on CPAP/BIPAP mask ventilation(NIV), it often goes hand in hand with requiring oxygen therapy as well during the times when you or your family member are off CPAP/BIPAP mask ventilation(NIV). Oxygen may also be required whilst being on CPAP/BIPAP. What normally needs to happen on home CPAP/BIPAP ventilation with a face mask(NIV) is that specialised services like INTENSIVE CARE AT HOME can help you and your family with making a transition from Intensive Care to a home care environment. 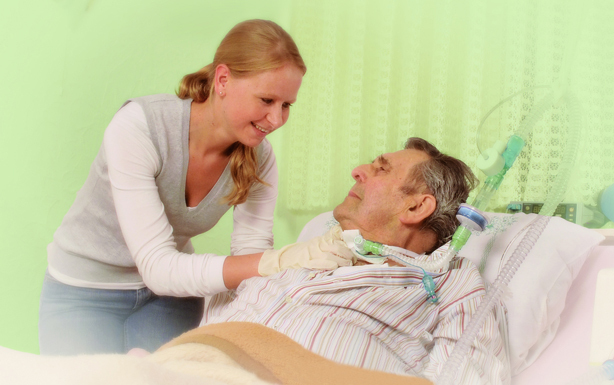 INTENSIVE CARE AT HOME is the first fully accredited Intensive Home Care service. This mode of ventilation is often only being used for critically ill Patients who are coming out of an induced coma and are being weaned off the ventilator. CPAP/BIPAP ventilation mode with a breathing tube or endotracheal tube is usually the ventilation mode just before your critically ill loved one can be taken off the ventilator and the breathing tube/endotracheal tube. Therefore CPAP/BIPAP ventilation with a breathing tube/endotracheal tube is not a ventilation mode that can be used at home as it’s only a short term ventilation mode. If your critically ill loved one can’t be taken off the ventilator and the breathing tube/endotracheal tube with CPAP/BIPAP they will most likely need a tracheostomy. If CPAP/BIPAP ventilation with a breathing tube or endotracheal tube is not getting your critically ill loved one off the ventilator, there is a very good chance that your critically ill loved one may need a tracheostomy. If that’s the case, tracheostomy ventilation with CPAP/BIPAP is actually a desired ventilation mode because it’s usually the ventilation mode that’s tolerated best by Patients with tracheostomies and mechanical ventilation needs. A tracheostomy and CPAP/BIPAP ventilation often goes hand in hand with a long-term stay in Intensive Care. A long-term stay in Intensive Care is very taxing, burdensome, depressing, expensive and risky for critically ill Patients and their families. On top of that, Patients and their families in Intensive Care have no quality of life and/or quality of end of life. Intensive Care Units are also often under enormous pressure to empty their beds with long-term ventilated adults& children with tracheostomies because of the $5,000- $6,000 per bed day price tag attached to it. It therefore makes sense to look for viable alternatives, which is where again, INTENSIVE CARE AT HOME can help you and your family. INTENSIVE CARE AT HOME, the first accredited Intensive Home Care service can make a seamless transition from Intensive Care to home possible for your critically ill loved one and your family. Your critically ill loved and your family one can improve their quality of life by being looked after at home by specialised Intensive Care staff and it’s way more cost effective! Will my 19 year old son EVER come off the VENTILATOR after he ASPIRATED during a SEIZURE? My Mum has been in ICU for three weeks now and she is on ECMO for ARDS! Will she SURVIVE? (PART 1) My BROTHER is in ICU after he had a CAR ACCIDENT and he’s NOT WAKING UP! Help! My Mum has been in ICU for three weeks now and she is on ECMO for ARDS! Will she SURVIVE? (PART 5) HOW LONG can a critically ill Patient stay on ECMO?